Vintage fashion inspires and expresses your personality. The fashion styles and designs from way back astound and bring back great memories of the past. Vintage pieces can be worn alone or together with contemporary fashion outfits. The BeeKeepShop has an amazing collection of nature-inspired jewelry for you. Here are best vintage bee jewelry pieces that work well with any outfit you step out in. This rhinestone brooch is great for events, parties and can be worn to work. It has a subtle feminine air to it. 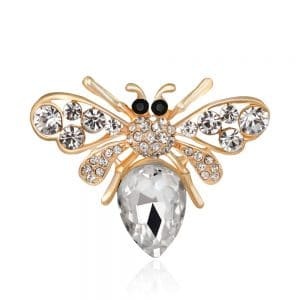 The vintage rhinestone bee brooch is made with sophisticated women in mind. It brings out your personality and uniqueness. The bee brooch is made to scale and features amazing stones on the bee body. It weighs 30 grams only. It is a great anniversary gift for birthdays or wedding remembrance. The brooch is reasonably priced and comes with free shipping upon purchase. This Vintage Rhinestone Bee Brooch is a very versatile accessory to your attire. The brooch can be worn on your lapel, hat or breast. It can also go onto your hair to give your hairstyle a touch of class. Step out with this fascinating brooch made using zinc alloy. It is safe for contact with your skin. Zinc alloy does not cause skin irritation. It also makes the well crafted brooch very durable. Gift a nature-loving friend, colleague or loved one with this rhinestone brooch today. The Bohemian Vintage Snap Button Bee Pendant celebrates the beauty of insects. It is built in a bee shape with a touch of modernity. The wings of the snap button bee pendant feature cog wheels. Similar circular designs are seen in the rest of the bee too. Excellent play with colors is also to be found on the bohemian vintage snap button bee pendant. It mixes red in the eyes of the bee, gold and brown brass colors to achieve unrivaled beauty. This bee pendant comes with a strong link chain. It is made of alloys of copper and zinc. The snap button pendant is safe to wear on your skin. It gives you an exquisite look and tells of your touch with fashion. This bee pendant is great for the free-spirited woman. It makes a perfect gift item for a friend, family member or colleague. The pendant measures 4 x 4 cm. It is very long-lasting and does not fade even with frequent use. Add a neo-gothic look to your style with these stud earrings. The earrings are made in a bee shape and look very nice on women. They are made using sterling silver and show excellent craftsmanship. These Vintage Handmade Bee Stud Earrings are beautiful to look at. They feature silver and black colors. The black is from oxidized silver used on the earrings. 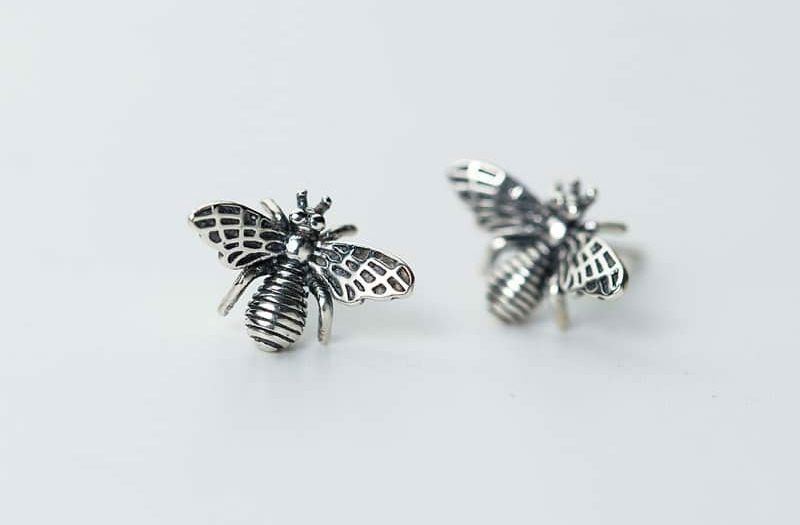 Keep your look simple yet visible with a pair of these bee stud earrings on your ears. They can be easily paired with a gothic outfit or necklace you are wearing. The Vintage Handmade Bee Stud Earrings are nicely small. They weigh 20 grams only. You hardly feel them on your ears. These feminine stud earrings are made in a great concept for nature lovers. They are classy, cute and very reasonably priced. 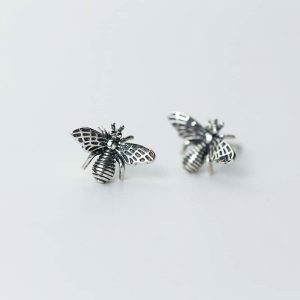 The handmade bee stud earrings give you a pretty look and shine well even in dim light. They give you an unbeatable sparkle. You can’t wait to wear them once you have a pair in your jewelry box. 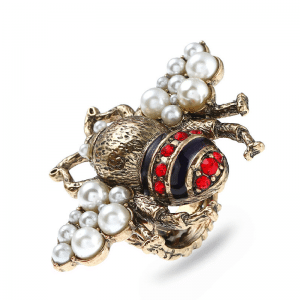 This Vintage Bee Ring with Pearls is a great adornment for your hand. It is made in a bee design and is adjustable. The ring features simulated pearls on the wings of the bee. A simple bee design is seen on the ring. There is adequate detailing of the bee on the ring without being excessive. The main body of the bee, legs and wings feature on the ring. Zinc alloy, acrylic and simulated pearls are the only materials used to make the ring. They do not irritate your skin or discolor it. The main stone of the vintage bee ring with pearls is black. It is broken by shiny rings with red stones set in them. This trendy bee ring stands out on your fingers and is very gorgeous. It is great for an engagement, an anniversary or wedding. The vintage bee ring with pearls immensely pleases the eyes of women who love pearls. It is a high-quality durable ring and does not fade or lose its shine. 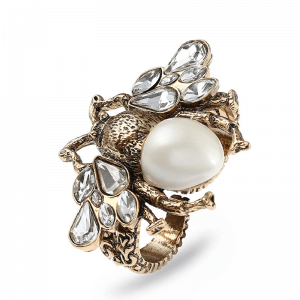 The Vintage Pearl Unisex Bee Ring is resizable and made using zinc alloy and resin. It features a modified bee design on the wings. A pearl is used to make the abdomen of the bee on this vintage unisex bee ring. Smaller shaped crystals adorn the wings of the bee. The ring comes in a dominant metallic color broken by the white and shine of the pearl and crystals. The ring is great for both men and women. It works well with any outfit you are wearing. This vintage pearl unisex bee ring is great for gifting to someone. It easily tells the giftee how much you value them. The ring is of super quality and very stunning. It is light in weight so you hardly notice you are wearing it. Use this ring as your fashion accessory of choice and project your sophisticated nature-loving personality with ease. It makes a statement with its colors, design and concept without having to be too big on your hand. This is a rhinestone bee ring that is set with pearls. It features an emerald green rhinestone. The ring is built in the popular vintage hyperbole ring design. 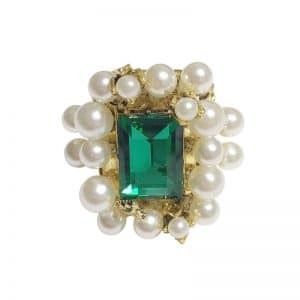 This vintage green rhinestone bee ring with pearls is beautiful and very pleasant to look at. The mix of colors it has charges up your mood and helps you stand out at any event you attend. This is a great fashion piece that works with women. It complements any attire you wear with its green and metallic colors. Be ready for a stream of compliments coming your way when you sport this Vintage Green Rhinestone Bee Ring with Pearls. This is a ring you can wear every day. It is made using zinc alloy that does not irritate the skin on your fingers. The ring is big; it makes a statement. This green rhinestone bee ring accentuates your personality. It looks very impressive on your hand and does not disappoint as a fashion accessory. 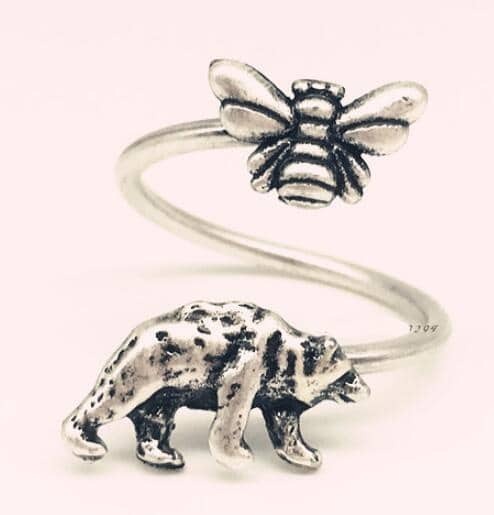 When you are looking for a ring that really tells about your love for nature, then this Vintage Silver Bear and Bee Finger Ring is the perfect ring for you. This ring features a bee on one end of the ring and a bear on the other. The ring is resizable too. It is built in an open ended design. This Vintage Silver Bear and Bee Finger Ring is made using zinc alloy. It comes in an antique silver color. Detailing of the bee and bear figurines is very nicely done. The ring shows very good quality construction and top-notch craftsmanship. This is a unisex ring. It gives you a sophisticated look when worn. The ring works well to add class to any outfit you choose to wear. This vintage finger ring is elegant and very lovely. Get a pair for you and your loved one, or gift them with one. The ring is great for when you are attending a party or other social event. Make a woman who is special in your life feel like a belle with one of these pendants. They are built in the ever-green vintage style using zinc alloy. The pendants come in a retro silver color that is difficult to beat. 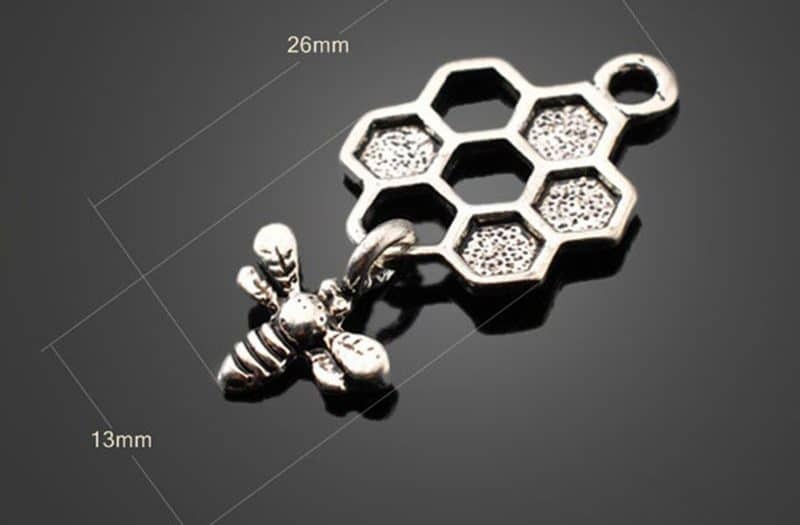 These vintage silver metal charm bee pendants are safe on your skin. The zinc alloy used does not irritate skin or discolor it. These pendants are nicely sized and discreet. They do not stand out too much but still manage to bring out your love for nature. These pendants come in a pack of 6. They make great gifts to ladies you treasure. With a pack of 6, you have enough to go around for all the women you wish to celebrate with the pendants. 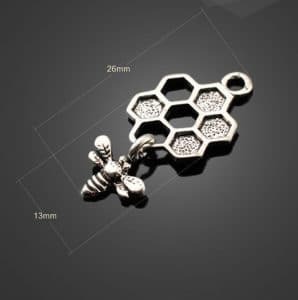 The Vintage Silver Metal Charm Bee Pendants work well with your formal and informal outfits. They are great for anniversaries, weddings and wedding parties. Try them out at the next social gathering you are planning to attend. These Vintage Silver Honey Bee Charms Pendants are made in a classic vintage style. They feature honeycomb cells and a bee. The pendants are easy to use on any necklace you have. These bee charms pendants have a wide loop that allows most necklace sizes through. The pendants measure 26 mm in length and are 13 mm wide. 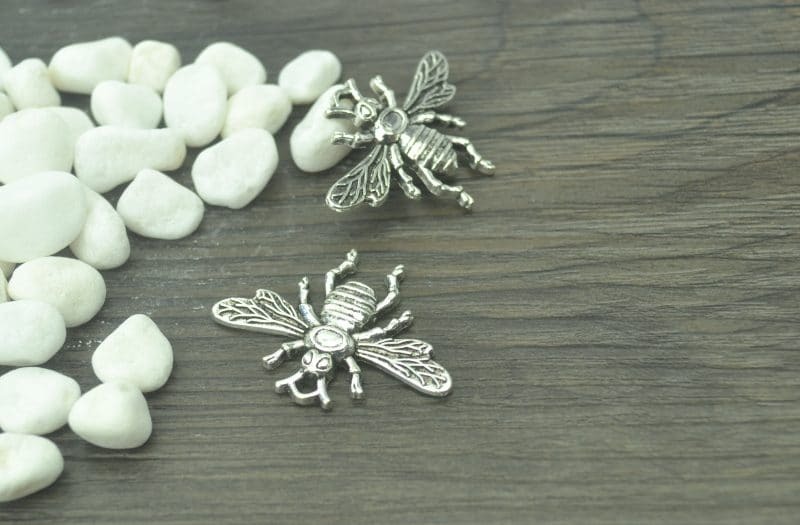 These vintage silver bee pendants are unique and classy. They add elegance to your look with their silver color. These Vintage Silver Honey Bee Charms Pendants come in a pack of 10 pendants. This allows you to use them as gift items. They are excellent for gifting to women in your life. The pendants work very well with the clothes you are wearing to give you a charming aura around you. Get these pendants today and enjoy the beauty they add to you. For a pack of 10, these pendants are very well priced. They give you excellent value for every penny you spend on them. 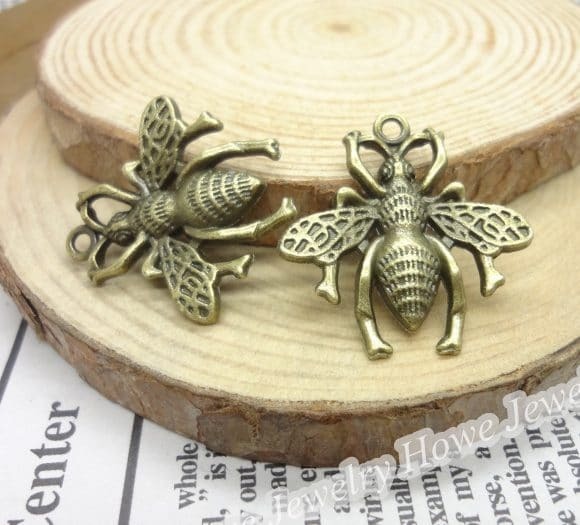 These Retro Bronze Metal Large Bee Pendants are large pendants for your adornment. The pendants come in a pair that is great for you and your loved one to purchase. These vintage-style pendants work well with your necklaces and bracelets. The pendants are made to resemble bees. They have great detail and show excellent craftsmanship. These pendants have their necklace loop located at the ‘antennae’ of the bee. It makes the pendants appear like a bee is crawling up your upper chest. They are nicely sized to stand out and give you a look of confident elegance. The pendants are made using zinc alloy. They come in a bronze brown color that does not fade. The zinc used in making the pendants is safe for contact with your skin. 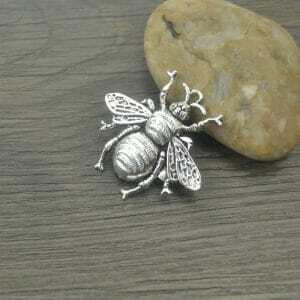 These metal bee pendants are also customizable. They are great as gifts and work well with outfits you wear to celebrations and events. Step out with one of these pendants on your neck and enjoy the added beauty they give you. They come in a pack of 2. These Tibetan Vintage Silver Bee Charms Pendants are a great product you will not regret buying. The pendants are gorgeous and well detailed on both sides. They even have some relief detailed on the back. These charms pendants are nice and very high quality pendants that you enjoy wearing. The pendants are great for bee and nature lovers. These pendants are unisex. They look good on both men and women. The Tibetan Vintage Silver Bee Charms Pendantss come in a pack of 10. The pack is great for when you plan to gift the pendants to friends, family, colleagues or loved ones. 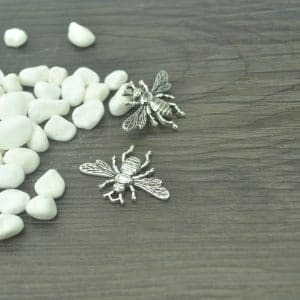 The bee charms pendants are made using sterling silver. They come in a silver color. These pendants weigh 2.6 grams only. You hardly remember you are wearing the bee charms pendant due to its light weight. Get one of these Tibetan vintage silver bee charms pendants today and see how they nicely customize your necklaces, bracelets and chains. 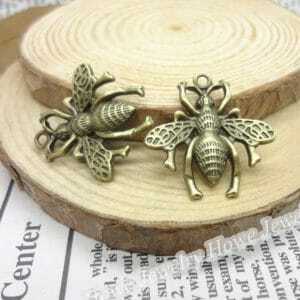 For those times you want simple yet elegant gifts, these Vintage Bronze Bee Charm Pendants are handy. They are sold in a pack of 35 pendants. A single pack should be enough to go round and leave one or two for you. The pendants are made in a vintage style using zinc alloy and coated with antique bronze paint. They are charm pendants that go into your necklace. They have a 2mm loop for the necklace to go through. The pendants are built in a modified bee figure and bring out the bee very well. 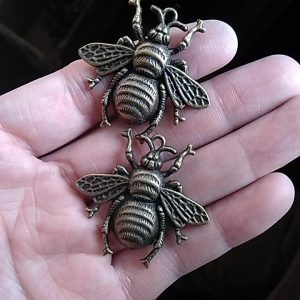 These Vintage Bronze Bee Charm Pendants are very reasonably priced. They give you great savings when bought in the pack of 35. The bee charm pendants weigh 0.12 kg only and are barely felt on your neck. These bee charm pendants are safe to wear on your skin. They are great for women who are not afraid of trying out new fashion trends. The pendants help you stand out from the crowd when it comes to fashion matters. These vintage bee jewelry pieces are excellent fashion accessories for nature lovers. They are great as gifts to beekeepers, your loved ones, friends, family and colleagues. The vintage bee jewelry items help you achieve a unique look and complement your fashion style. Both men and women are suited by at least one of these jewels. Use these detailed vintage bee jewelry to add class and elegance to your look.